Tailor your current carpets to a Dynafit ski with some climbing skin attachments. Priced individually, packaged as pairs. Add 2 if you have a pair of skins to fix. If you just need one, we will break the set so it will be unpackaged. Rubber Tip - The rubber tips that fix Speedskins to the notches found in the tips of Dynafit and other skis. AKA Fix Long. Tip Plate - The plastic plates emblazened with the Dynafit logo that secure the rubber tips to the skin in a replaceable fashion. AKA Click System. These have a ring of soft plastic that you can stitch through. End Hook - Simple metal clasp used to hook the tail of a skin to your ski. Comes with rivets. The Contour tail hooks are the same, grab those if out of stock. is the new Dynafit skin (for example the speedfit 84) tail clip (the metal clip with snow leopard head on it) available? We do not have any tail clips in stock. For an alternative you can use these. hi I would like order Skin parts and what will be shipping duration to Delaware? Great Davit, you will have some shipping speed options at checkout. Is there a video available to see how to attach this piece? Are we getting just the rubber tip, or the whole top (rubber tip with the labeled affixed section). I have to cut down a 208 to fit a 173 so I’ll need to re-affix the whole piece at the top (which is currently sewn on)? Hi Regina, the item "Rubber Tip x1" is just one rubber tip and not the piece it pops in to. FYI it's way easier to move the tails than the tips when shortening a Dynafit skin. Just rivet on a new tail hook (available from Ski Trab, Kohla, Contour, etc). Hey Tony! It doesn't include the tip, tail, and tip plate as they're all sold individually. However, we have made a number of skins for skis like that so it's definitely doable. Ordering the bulk material (ski length x 2 + 10cm = the length of material you'll need), two rubber tips, and then the tail clips will be the best option. Tail clips can be found in various places, but the Ski Trab Tail Hook Kit is one of the better ones. Let me know if you want any extra help! Will you be getting anymore of the tip plates and end clips in stock? Hi Pete, it's looking iffy on either of those. In the meantime, you can fold the skin right over the rubber tip-bar and use the Contour tail hooks. Hi Jules, the tip is a little fat for the Voile tip when unstretched, but with a little tension it slides in just fine. That said, cord systems seem to slot in a little easier. Hi Skimo - do you sell the plastic covers that go over the dynafit speed skins for the Denali 176? On a trip last week I lost one of them for storage. Bummer about your protective sheet. The good news is that we have some available that will work and continue to protect your glue during storage. We sell a few different brands, but my favorite have always been the Black Diamond Cheat Sheets. The 140mm size would probably work best for the Denali, and you can find them here. I'm with Jonathan- these are the best skin tips. I converted towards the end of last season and now put these on all of my race skins, and really any set of skins you can pull from the tip. They provide the best grip and the most secure attachment- less "sloppy" than the bungee-based systems. Agree also that it's best not to bother with the plates. The speedy stitcher awl works well for attachment. I just purchased the women's Manaslu skis in 174cm and I'm having a heck of a time finding skins for them. I live in Eastern Canada so that's part of my problem lol. My understanding is that I can buy the Dynafit skin parts listed above (I would need one of each correct?) and then buy skins that are the proper width and length and then retrofit them? Is that right? I really want to take advantage of the notches in my skis as I've heard nothing but great things and it's just so much simpler! Any help is appreciated! Thanks! Hi Allie, you could get some material or another skin and attach these tips. It's probably easier to get a bigger Dynafit skin and lop off the tails. You could attach new tails or just go without. I have a pair of Black Diamond skins with loop on tip and rubber adjustable catch for tail. Can I use this product to modify the skin to fit my new Dynafit Denali ski's (assuming the length is adequate)? How are they attached to the skin? Rivets on both sides? and can this be done at home without special equipment? Hi Norman, those skins should work fine on the Denalis as is, though you won't get the nice "rip from tip" feature of the Dynafit style skins. To enable that feature, you'd need to sew on these Tip Plates, or fold and rivet the skin over the Rubber Tips if there is enough length. If there isn't enough length, you can hack off the tail clips and go commando. Hey Dave, Dynafit doesn't show any of those metal tips in stock but I will investigate further for you. Hey. What do you think my best option for skins on my 2014 dynafit manaslu's are. They don't seem to make them anymore? 1) Buy a trim-fit-kit that uses a more standard attachment system, probably Pomoca since they make the Dynafit skins. 2) Find a pair of similar length yet wider skins with the same attachment system, then trim. e.g. Hagan Y-Boost might work for the 178. 3) Sew some Dynafit tips on existing or new skins, and optionally rivet on some metal tail brackets. Then trim. Five Stars for Dynafit’s rubber tips: brilliant simplicity, a stark contract to so many other complicated tip hardware systems on the market. I also prefer its more secure grab for deskinning over both homemade and commercially constructed bungee-based systems for race skins. I’ve used them on three Dynafit skins (including the race model) and retrofitted them onto about half a dozen mohair race skins, plus another touring skin. To adapt the tips to touring skis that usually lack a tip notch, you can be brave and create one: Skimo Life. Don’t bother with the separately sold plastic “tip plate” receptacle, and instead just sew the rubber tip in directly using a Speedy Stitcher Sewing Awl (for the equivalent of the tip setup on the Dynafit Race Ready skin). You’ll lose the advantage of field replacement for the rubber tip, but this is an advantage only if you carry an extra tip on your tours, which doesn’t seem worth the bother anyway given their apparent longevity. As for longevity, my Manaslu skins that have over 300,000 vertical feet, still no signs of cracks or tears in the rubber tips. And ditto for the many other tips I’ve retrofitted onto various mohair race skins with lots of use, with some tips even on their second pair of skins. Agreed with everything Jonathan has to say here. I'll add that a 1/2" hollow punch is useful for making a hole in the skin. You'll have to squeeze the widest part through but it's nice and snug around the base. 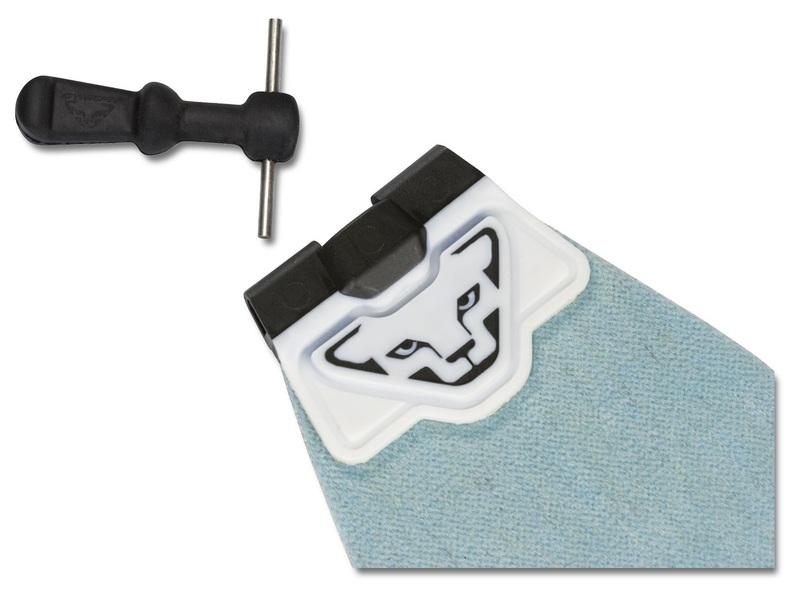 Many thanks for the tip on the hollow punch -- just ordered one, and sure would have saved me lots of time previously!